This article was originally published in the November issue of Between the Worlds, the online magazine for Diana's Grove Mystery School. I write an astrology column for that magazine. Cynthia Jones, co-founder of Diana's Grove Mystery School, knows how to tell a story. For ten years, she has crafted stories for the Mystery School, stories that have led her readers onto the path of discovery. This year she told a story called “Jennet’s Blessing”, a story that was based on the Scottish ballad of Tam Lin, but was really the story of our own individual journeys of longing and courage. Registration is now open for next year's Mystery School. 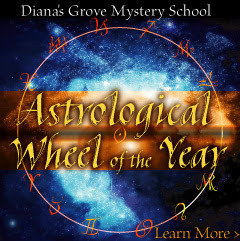 As Cynthia describes it, the 2008 Mystery School theme, The Astrological Wheel: Seasons of the Soul, will be based on astrology but won’t really be about astrology. I find that exciting because Cynthia knows so well how to reveal the wisdom behind the archetypal patterns of things like myth, tarot and astrology in ways that empower lives. Astrology does so much more than tell us about our personalities or our fates, although it can do these things surprisingly well. Astrology is a representation of the power of archetype, the power of pattern. Astrology’s uncanny ability to tell us a meaningful story about ourselves and our world indicates that it is really telling us something deeper and more profound about the nature of the cosmos and the nature of our own souls. I am eager to learn more about the power of these patterns as Cynthia guides us through the wisdom of the seasons. Richard Tarnas, an astrologer, historian and philosopher, has written about the study of astrology: “[The] ultimate goal of knowledge is not increased mastery, prediction, and control but rather a more richly responsive and empowered participation in a co-creative unfolding of new realities.” His latest book, Cosmos and Psyche: Intimations of a New World Order, describes how astrology helps us to re-enchant our understanding of the cosmos, and he theorizes that this type of understanding opens up all kinds of new creative possibilities for us. Imagine following the story of each season. Imagine deepening into an awareness of your place in the pattern. Imagine understanding the place of others around you. Mystery School 2008 will make that possibility available to each of us. The world does not need astrology. There are many ways to access the Pattern behind the patterns. The original patterns, or archetypes, can be found in myth, in systems of psychology, in meditation practice, in religion, in science, in community dynamics and in many other places besides. As an astrologer, this is what I have seen without fail: There is a basic human drive to search for meaning, an instinct for seeing the pattern that emerges from seeming chaos. This instinct is not simply wishful thinking on our part, but is, in fact, our greatest act of imagination and creation. It can lead to those possibilities Tarnas writes so passionately about. My own participation in Mystery School has been a journey of personal wholeness: the wholeness of knowing my life path, the wholeness of healing, the wholeness of connection to others, the wholeness of acting as a leader within a community of leaders, the wholeness of upholding values, and the wholeness of serving the wholeness of others. Astrology has taught me that patterns hold meaning and wholeness. Within the patterns of nature—the unfolding seasons; the cycles of the Sun, Moon, and planets; the dance of the elements — I find instructions for wholeness. Too often, in our modern world, we experience nature as separate from our own lives. A year of paying attention to and learning from the stories of the seasons promises a new way to belong to the world around me. That is a type of wholeness too. This next year also promises to teach me things I can use in my own practice as an astrologer. Astrology’s structure, with its signs and planets and houses, captures the underlying order inherent in the cosmos. But I must hold this order lightly. If I attempt to control my environment by relying too much on the pattern, boxing in my imagination, I often run into dead ends — my lovely systems and theories do not work in real situations with real people. I believe that, for me, exploring astrology’s patterns in community will deepen the usefulness of this tool. One of astrology’s most powerful lessons for community work is this: All things are necessary. All types of people, all the signs, all the seasons, all the polarities of signs, all the stories in the stars. Wholeness means everything — in balance, in right relationship. Astrology points the way toward this understanding, and it is up to me to try and live it. Some may enter Mystery School next year to learn more about the craft of astrology, and they will be very fortunate to study with Cynthia Jones. She will be presenting a session on astrology each weekend at Mystery School events. I will also be offering an online astrology class this year for those registered for Mystery School However, learning astrology will not be necessary for those who do choose to. The stories of the soul’s seasons will connect us all. There will still be myth. There will still be growth. Original patterns are like that. They manifest in many forms, when and where we need them. Time, pattern, and Mystery are the essential ingredients of astrology. We are born into Time, and a pattern is set. From this pattern, it becomes possible to enter into a relationship with Mystery. These ingredients, along with a desire for personal wholeness, are all I need to use astrology as a gift of imagination that leads to possibility. These are the ingredients of our journey through the seasons of the soul in Mystery School 2008. Please join us. This lunar month Mars will station retrograde at 12 degrees Cancer on November 15. See the New Moon post for September 11, 2007 to read more about the hero’s journey of Mars retrograde. We are now, right in the middle of that journey at the point of turning around and following a deeper inclination. Do you hear the call of the task before you? This lunar month will be a good time to dare to be courageous and follow that inner voice of action. And, it might not be easy. The idea of a retrograde of any planet is that the “normal” expression of that energy, which can become habitual and unconscious, is turning around causing us to rethink and express that energy in new ways during the retrograde period. We will have the opportunity to reconsider how we use our Mars energy. This energy is connected to will, passion, anger, and desire. 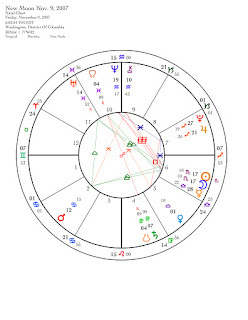 In the chart for this New Moon, Mars is in an aspect pattern called a Grand Trine. All the planets in this pattern are in the water signs—Mars in Cancer, the Sun and Moon in Scorpio, and Uranus in Pisces. Water is linked to our feeling natures, our intuition, to empathy. Water changes form most easily of the elements. It seeks the lowest place it can reach. It operates under the surface. It is the tender place in our hearts. How do you see the qualities of water combining with the qualities of the hero? Astrologically, Cancer is not an easy place for Mars to be. But that doesn’t mean that being in Cancer is not a profound place for Mars to be, especially at this moment in history. It takes courage to come from the heart. The Sun and Moon and the planet Uranus are allied in this quest. Uranus brings authenticity; the Sun and Moon bring alignment of self and soul. Mars’ story is important because it only takes this retrograde journey every two years. But this is not the only celestial event pointing towards the significance of the hero. There is a comet putting on an unexpected display right now in the constellation of Perseus. (See spaceweather.com for information about the explosion in size of Comet Holmes.) There are interesting correlations between the Mars hero’s journey through Cancer and Gemini and the story of Perseus. According to “Celestial Tarot” by Brian Clark, “Prince Perseus was the son of Zeus and the first hero of Greek mythology, immortalized for his decapitation of the Gorgon Medusa.” The reason he had to do this task was to save his mother. The water sign, Cancer, carries the theme of the mother. There are more water themes in this story. On the way back from killing Medusa, Perseus, who was given Hermes’ winged-boots (a Gemini theme) flew over the shoreline where he saw Andromeda, the woman he was to fall in love with and marry, chained to a rock by Poseidon. Perseus then had to fight the sea monster, Cetus, in order to rescue her. Clark writes about Cetus: “monsters are guardians of treasure and symbolize the obstacles to be overcome in order to claim the material or spiritual wealth.” Poseidon’s challenge to Perseus is a theme supported by Uranus in Pisces. Perseus absorbed the Gorgon’s power to turn into stone anyone who looked into her eyes by decapitating her (a theme supported by the New Moon in the piercing sign of Scorpio). What must I protect? What task will I dare in order to protect that which is close to my heart? What monster of the deep do I face in order to win my heart’s desire? How will I use the Gorgon’s power of deep penetration? Can I freeze my own resistance to being a hero of the heart? November 15 - Mars stations retrograde at 12 degrees Cancer. The next New Moon occurs on December 9 with Mars still in Cancer and still retrograde. I will write about more important themes and dates in the next New Moon post.